There is one Quality, which has somewhat so heavenly in it; that by so much the more we are possess’d of it, by so much the more we draw nearer to the Great Author of Nature. Eliza Haywood was an English novelist, playwright, actress and publisher. Described as "prolific even by the standards of a prolific age", she wrote and published over seventy works during her lifetime including fiction, drama, translations, poetry, conduct literature and periodicals. 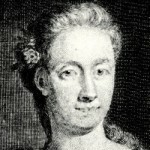 Haywood’s writing career began in 1719 with the first installment of Love in Excess, a novel, and ended in the year she died with conduct books The Wife and The Husband, and the biweekly periodical The Young Lady. The first notice of her name comes in a listing for The History of Timon of Athens the Man-Hater , a play staged at the Smock Alley Theatre in 1715. In 1723, her first play, A Wife to be Lett, was staged.